Inspiration comes in the strangest places. I post on twitter frequently. If you don't understand twitter, it's like text messaging on a large scale. People create networks and share information. Many of the people are bloggers or run small businesses. We share links to support each other. One of the tweeps called Backpacking Dad started his own virtual conference for those who couldn't go to the big blog conference. It started as a bit of a joke and has evolved into some really great fun. 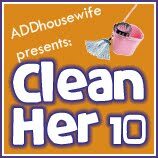 That has inspired me to really create my own blog tour called #CleanHer10. It's kicking off Monday with #TheKidsAreBackInSchool! The goal for this week long celebration is ideas and tips to get your home back into shape once the kids are back in school. Homeschoolers are not being left out. Homeschool participants are invited to share their tips for keeping life organized with the kids at home, so maybe the rest of us can prevent the absolute chaos and disorganization that happened over the summer. I am going to post my daily goals each day starting Monday and invite each of you to share your goals. I do not have a custom linky, but if someone who has an account for custom linkys would like to hook us up, that would be all kinds of awesome! For now, please just add a comment to this post with a link to your blog. Grab a badge created for us by QandUs. I'm just an idea person...I'll let someone come up with the plan! I'm in! Kids don't head back to school until the next week, but getting this house clean is always a challenge! I'm in because we're moving in four weeks and my motto is "If it hasn't been used in the last year, I'm not packing it"
Awesome idea! My kids aren't in school yet but I will definitely be following! I am totally in! I don't have a kid going back to school (hey, she's only four months!) but my house... uhh, I'm still adjusting to the new baby? Ha! Get out the rubber gloves and the feather duster!! Oh this sounds like such a good idea!! I am not sure I am the best to participate because well...housecleaning is not my best thing! But I could try! Adding a linky to your post is very easy, just visit http://www.linkytools.com/ it is very easy to use. Email me if you need some help!! loriandtonytt at comcast dot net. P.S. I have so been laughing with Backpacking Dad all week too!! I'll take any help I can get! I love this idea and my boys start school tomorrow but I totally am not up to keeping up with it this week.